2 X 14 Victorian Floor Register - Flat Black Discounts Apply ! 2 x 14 floor registers are styled after the traditional Victorian design. Air vents are crafted with all steel construction including the damper. 2 x 14 floor registers offer one step drop-in style installation. these air vents can also be used as wall registers when you purchase the clips separately. 2 x 14 floor registers offer a fully adjustable steel damper for air comfort control. 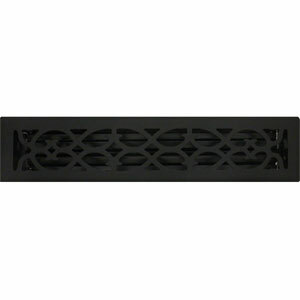 Air vents have a matte black finish with a protective top coat to minimize rust and corrosion. ***Hint: When ordering your 2 x 14 floor registers, industry standards require that you measure using the actual duct hole opening dimensions and not your existing register's faceplate dimension. These Victorian air vents will fit a 2 x 14 inch hole opening. 2 x 14 floor register vent covers can also be used as a wall mount register. Just purchase these wall clips to attach Victorian style air vents to the wall. These beautiful Victorian style floor vents have the look of cast iron without the price, order today!